Molasses Reef is a really nice and popular Key Largo dive site for many reasons. A lot of the charters who transport eager divers around the area call it the aquarium. And it really isn’t too hard to see why. Firstly it is a very beautiful reef to dive at, and is plentiful with marine life and things to look at. Secondly it has great visibility due to the current in the area generally leaving the floor bed and sediment reasonably untouched. And best of all….yes even after these first two plus points it’s not just one reef, but instead a collection of reefs, which give great variety to anyone looking for the perfect Florida Keys dive site to explore. So let’s start with a little bit of background information as to how Molasses Reef got its unusual name, where the reef can be found, and what you can expect to find there. We will also provide names and contact details of dive companies that use Molasses Reef as one of their chosen daily dive locations. With all that information you will be set for a great day exploring beneath the waves of the Key Largo waters. How Did The Reef Get Its Name? If you look into the legends surrounding the Florida Keys waters, you will find a history more likened to a scene from the Pirates of the Caribbean movies. With many of the wrecks being victims of high seas piracy and violence. However the wreckage that can be found around Molasses Reef, and there is quite a bit of wooden stuff laying on the seabed, is highly likely from the wooden hulled Austrian ship – Slobodna. The Slobodna ran aground on the reefs back in 1887, which as a lot of the reefs are named after unfortunate victims that met their demise on the rocks, means that we have to go back even further to find the real reason why the area is known as Molasses Reef. And that is where we get into the realms of legend, and the definitive reason for its naming can’t be accurately confirmed. But according to stories a barge that was traveling the waters with a cargo of Molasses barrels, was brought to a sticky end here. So it wasn't who was sunk that caused the naming of the Molasses reef, but more to do with what was being transported. Nowadays we would probably get new reefs being called IPAD Reef or Tablet Reef which really doesn't have the same kind of ring to it. What Is The Exact Location Of Molasses Reef? If you look on the map of Key Largo you will see that the majority of the diving locations are covered on the Atlantic side by John Pennekamp State Park. The park was the first underwater state park and is an absolute mecca for divers the world over. 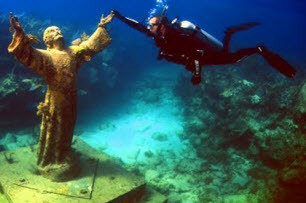 I’m sure you will have seen the classic and iconic Christ of The Abyss shown below, which is just one of the attractions in the area. Well Molasses reef can be found along the southernmost parts of the state park, and with over 30 mooring buoys and depths that range from 10 feet to 50 feet, you will be doing well if you find yourself alone on the dive. With such a range of reefs, caves, coral and of course wildlife to attract and amaze, you will definitely find yourself surrounded by snorkelers and scuba divers unfortunately. I have actually heard that many consider Molasses Reef as the most popular site in the whole of the Florida Keys, which is hard to dispute knowing what it has and where it is. Although you can use the coordinates above if you are thinking of sailing your own boat out to the site, you will be able to narrow down its location by the 45 foot tall light tower marking the area. What Can Be Found At The Reef? As we said previously there are over 30 mooring buoys marking the area, which is great news for the snorkelers, divers and the really experienced divers, as they clearly mark water depths. Most of the markers from 1 to 33 are all marking the shallower dives that are perfect for snorkelling, whilst if you fancy going to greater depths then it is marker 21 and 23 that you need to be focused on. If you look for depths no more than 40 feet, you will find yourself amongst groove coral formations covered with a huge variety of sponges. The sponges are magically colourful, leaving you feeling that you are swimming into the world’s largest underwater tapestry. Going deeper, you will be viewing seawards and chutes, as well as fishes and marine creatures, until you get to the drop off at around 60 feet. Masses of fish ranging from moray eels, parrot fish, turtles, rays and even sharks will definitely be companions at your dive no matter what depth you decide to dive to. The cave and ledges make the perfect hiding places for the marine life to keep out of harm’s way and build their homes. And many of these caves have a distinctive feel to them leading to names such as Spanish Anchor Winch Hole, Fire Coral Caves, Hole in the Wall and many others, all of which can be explored at your leisure. “The Winch hole” is at Marker Eight. “Hole In The Wall” can be located just southwest of the Winch Hole at Marker Eight. At Markers Eleven and Twelve wreckage from a 400 feet freighter by the name of M/V Wellwood which ran into trouble in 1984 on Molasses Reef and caused a huge amount of destruction much to the distress of the Florida Keys Marine Sanctuary who preserve the area. Lastly there is even an old anchor and boat winch to go looking for, which was left behind by their owners, that adds to the fish tank feel. So what with the caves, anchors, wreckage, and myriad of fishes around, you only need a treasure chest and a diver that goes up and down in the corner and you will complete the scene perfectly. So it really accepts and plays up to its nickname of “The Aquarium” and is a delight for all who seek it out. What Are The Best Companies To take Me Out To Molasses Reef? Well it’s not really the case of what are the best companies, as the majority of charters who have offered their services for this activity; they are hugely experienced and regulated. So it’s more to do with what you fancy doing, and with how many other divers and snorkelers. Some of the charters will stick to regulation of 14 people on their boat, whilst others advertise that comfort is more important and will keep the attendance at lower levels. Others will allow you to travel on the boat naked too! So the options are down to you, but whoever you choose I will guarantee that you have found a new dive site that will have you coming back year after year. Molasses Reef is not one of the most popular dive sites in the Florida Keys and the whole or Florida without reason you know.